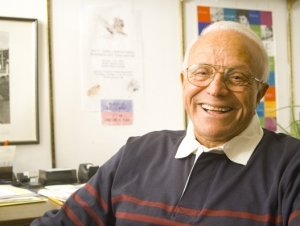 The spirit of Horace “Hank” Mann, SUNY Distinguished Service Professor Emeritus of exceptional education who passed away in 2010, continues to grace the SUNY Buffalo State community. It can be felt through his ongoing inspiration to faculty who are grooming future teachers and through his remarkable generosity to the college. 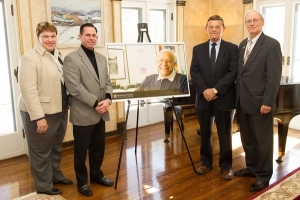 On February 28, a $2.25 million gift from Mann’s estate was presented to Buffalo State Interim President Howard Cohen during a private luncheon in his home. This gift, coupled with Mann's previous gifts, makes him the largest donor in Buffalo State’s history. The retired professor has given more than $7 million for scholarships, to establish the Horace Mann Endowed Chair, and to help grow the exceptional education program. "This means so much to Buffalo State and to one of our core programs," Cohen said. "We are immensely grateful." Since 2001, Mann has made several planned gifts that have endowed at least a dozen funds on campus. His gifts extend beyond the Exceptional Education Department. For instance, he established the Hank Mann Award that recognizes the campus’s physical plant workers with citation awards and monetary gifts. "Hank Mann strongly believed in the importance of every individual’s contribution and in recognizing work behind the scenes," said Vice President for Institutional Advancement Susanne Bair. "He demonstrated that belief by making gifts that touched all parts of the Buffalo State campus." After teaching children with developmental disabilities in the New York City public schools in the late 1940s, Mann received the first-ever doctorate in special education conferred by Penn State University in 1953. That same year he was hired to lead Buffalo State’s fledgling Exceptional Children Education Division. Under his leadership, more than 7,000 exceptional education teachers have received training preparing them for a plethora of crucial jobs working with a once overlooked population. Mann advocated for the rights of people with disabilities long before the Americans with Disabilities Act was on the radar and before the creation of inclusionary classrooms for schoolchildren. He was frequently asked to share his expertise with school districts, government agencies, private foundations, and universities, and he became a champion for change. Meanwhile, the undergraduate and graduate exceptional education programs at Buffalo State grew to rank among the largest and most influential in the United States. 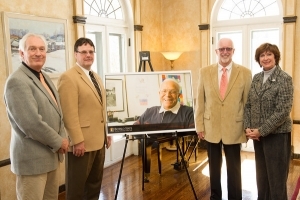 During the recent luncheon at the president’s house, guests, including Exceptional Education Department Chair Kevin Miller, School of Education Dean Wendy Paterson, retired exceptional education faculty, and friends of the college, shared memories of the beloved educator. They painted a picture of a fun-loving man who was accessible to his colleagues, who had an abiding commitment to students, and who demonstrated a selfless dedication to the campus as a whole. Richard Lee, dean emeritus of applied science and science education, told of a day early in his career when Mann popped into his faculty office holding a pair of gardening shears. "He said it was time to trim the roses," Lee said with a laugh. "He loved the rose garden and expected us all to help with its upkeep." Lee and others also humorously recalled Mann’s frugality—his penchant for wearing frayed khaki pants because "they were still perfectly good," for inviting colleagues to "eat out," by partaking of free samples at Wegmans grocery store, and for filling doggie bags from restaurant buffets he frequented. Mann's frugality may have played a role in his ability to accumulate wealth, but the educator also made smart investments years ago. His decision to share his wealth with Buffalo State stems from ethics instilled in him as a child. Raised during the Great Depression, Mann was taught to save one-third of his earnings and also to give one-third to charity. He also shared so much of himself as an educator. When Mann died, Buffalo State received condolences from educators all over the country who were knowledgeable of Mann’s many contributions to the field. "He had a profound effect on my career and the career of many," Miller said. "We are looking forward to continuing his legacy." Buffalo State students and alumni have the opportunity to create a permanent sculpture honoring Mann, one of the campus’s most beloved educators. The Fine Arts Department is hosting a sculpture competition in Mann's memory. The piece will be installed in a dedicated garden on the east side of the Donald Savage Theater and Communication Building in the spring of 2015. "We are doing this project as part of the naming of the quad for Hank," said Bair. "The committee working on the dedication of the quad and garden thought Hank would like a piece of art to be included, rather that something depicting a likeness of him." Designs for the sculpture are not limited in style, size, or medium, but they must reflect Mann’s legacy and his dedication to education, said Philip Ogle, professor and chair of fine arts. Additionally, the sculptures need to be created of durable materials capable of withstanding the elements and should require minimal maintenance. Both individual artists and groups are encouraged to send submissions. The selected artist or artists will be awarded $15,000 in June to cover all expenses. The competition, judged by five members of the Art on Campus Committee, is divided into three phases. For the first phase, artists should send a resume and a CD with five to 10 examples of previous work reflecting their ability to handle a project of this size. The deadline is April 15 and three finalists will be announced on April 30. In the second phase, with a deadline of June 15, the finalists will each receive $200 to review the site and produce a model of their proposed sculptural installation. Proposals must include a timeline, budget, techniques, and installation details. For the third phase, the jury will interview the artists and study the models to make the final selection. The sculpture commission will be awarded June 30. 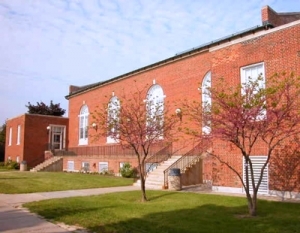 Send submissions for the Horace “Hank” Mann Sculpture Competition to: Philip Ogle, Fine Arts Department, 502 Upton Hall, Buffalo State, 1300 Elmwood Avenue, Buffalo, New York, 14222. For more information on the competition, call (716) 878-6014 or email paynekp@buffalostate.edu.